Michael Miclon, executive and artistic director at Johnson Hall Performing Arts Center in downtown Gardiner, has been a professional entertainer since 1982. He began his career as an apprentice of Benny and Denise Reehl of the New England New Vaudeville Revue and a student of Theater Master Tony Montanaro at the world-renowned Celebration Barn Theater. Michael has performed around the world from India to South Africa, Europe, and North America, with such highlights as the White House and Kennedy Center in Washington D.C to Victoria Jungfrau Hotel, Interlaken, Switzerland‎. 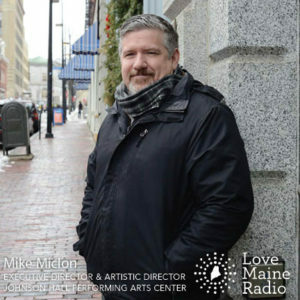 In 2000 Michael became the executive director of Maine Arts Inc. in Portland Maine and produced the Maine Festival and New Year’s Portland. Michael then created his own theater in Buckfield called the Oddfellow Theater, which he ran for fourteen years before coming to Johnson Hall.